GH Spoilers – Nelle Steps Up Her Gaslight Game! This week, Nelle also toys with her employer and mob princess, Ava Jerome’s (Maura West) head too. Why is Nelle doing this and what could she possibly gain from destroying both these women, Ava has been nothing but kind to Nelle? Damian Spinelli (Bradford Anderson) has always been the reliable one with all the information at his fingertips. But GH fans knew when he left on this mission to impersonate Henrik Faison (Wes Ramsey), he was going to be a fish out of water out on his own. Spoilers reveal this week, Spinelli is indeed the one who needs rescuing this time. The mission also proves difficult for super-spy Anna Devane (Finola Hughes) who doesn’t get any answers but is determined to keep going. Robert Scorpio (Tristan Rogers) wants to put Henrik down like a dog with no clue the guy is Anna’s son! General Hospital spoilers from Soap Central show that Dr. Kim Nero (Tamara Braun) and Julian Jerome (William deVry) have more than just a casual friendship, as she continues to show up to support him. This week, Kim pushes Julian to be there for his family, but she’s also got her eye on newly-single Drew Cain (Billy Miller). He’s closer to Franco now but his family sitch is a mess. Is this the end of Kim and Julian, and what does this mean for Kim and Drew, the man who has no memory of their own past? Julian’s family is in desperate need of fatherly advice. Dr. Lucas Jones (Ryan Carnes) and his husband Brad Cooper (Parry Shen) are in the process of adopting a baby, or so they think. Plus, Julian’s daughter, Sam Cain’s (Kelly Monaco) life is in shambles. Can Julian help his kids? If ever there was a time that Sam could use her father, it would be now – if not for their horrid past! Will Julian be able to redeem his misdeeds enough to help his strong-willed daughter? Meanwhile, what will happen between Sam and Jason Morgan (Steve Burton) during their Swiss encounter? General Hospital spoilers tease that Ava may prove to be her own worst enemy when it comes to her relationship with Dr. Griffin Munro (Matt Cohen). He believes the best in her, and while he is comforting her this week, it seems she might be turning back to her old ways to get things done. Will Griffin put up with her scheming, or is Ava about to lose the best thing that has ever happened to her? Be sure to watch ABC’s GH weekdays to catch up on all the excitement happening in Port Charles and check back with Soap Dirt often for all our General Hospital spoilers and news! ← ‘Young And The Restless’ Spoilers Week of April 16-20: Free Jack Confronts Victor – Hilary Could Be Preggo! 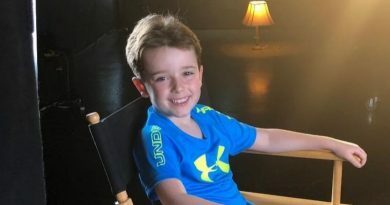 ‘General Hospital’ Spoilers: Young Male Actor Auditions For GH – Which Child Will Aiden Anderson Play? 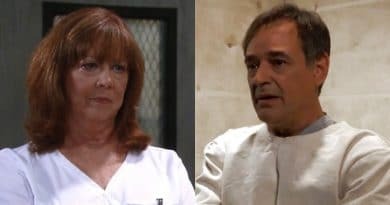 ‘General Hospital’ Spoilers: Ryan Threatened By Mary Pat – Kevin’s Only Hope?